Joining scores of stakeholders in the Nigerian oil and gas sector at the two-day public hearing held at the National Assembly Complex in Abuja, SPACES FOR change | S4C submitted and publicly presented its 6-paged memorandum on the draft legislation to members of the federal parliament. 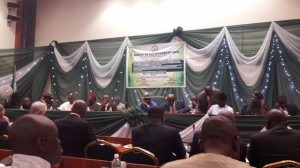 Diverse stakeholders from the public and private sector also brought differing perspectives to the table regarding the three legislative proposals. Oil Producers’ Trade Section (OPTS) expressed deep concern about the fiscal terms espoused in the Petroleum Industry Fiscal Bill (PIFB). They argue that if the proposed fiscal policies are passed into law, joint venture (JV) oil production will continue to be underdeveloped, while deep water production will come to a standstill. OPTS further argued that the Bill created multiple tax parameters, significantly increased deep water royalty and excludes companies with new gas production investments from earning allowance. In consequence, only 54% of new JV gas projects will be viable as against 66% under current terms. Small and medium-sized gas fields will remain underdeveloped. To avert this, it was necessary to preserve the forms under which past investments were made. On the Petroleum Host & Impacted Communities Development Bill (PHCDB), OPTS argued that the bill imposes excessive financial burden on operators through the establishment of community trusts for host communities where they operate. The obligatory financial contributions by oil companies to the community trusts will also expose operators to multiple litigation. The requirement for an additional financial contribution does not take into account the existing corporate social responsibility (CSR) initiatives instituted by oil companies, not to talk of the $2.3 billion (USD) that oil operators have paid in tax between 2014-2016. Furthermore, the Bill requires the National Petroleum Regulatory Commission (NPRC) to resolve disputes between oil companies and the petroleum host and impacted communities. OPTS contends that the Bill did not assign any role to the state governments. The Commission is often detached from the issues between host communities and operators. Therefore, state and local governments, who are much closer to the areas of operation, need to be recognized and enabled to play certain roles in the dispute resolution process. Rivers State Government agrees with OPTS that state governments need to have a role in the process of oil sector governance. Supporting the position of OPTS, Exxon Mobil and Chevron added that the production allowance proposed under the new fiscal regime does not offset the investment value. Deepwater discoveries of largely medium sized fields are uneconomical and unviable under the current terms. The Bill should therefore contain flexible fiscal terms to boost national revenue. A number of independent commentaries aligned with the position of OPTS and the oil companies. For instance, there were demands that exploration be appraised. Exploration needs some incentive: companies are incentivized to explore. The bill does not provide those incentive and this needs to be done to boost investment frontier basins such as the Anambra basin, Chad basin, Bidda basin, Sokoto Lome basins. Petroleum Contractors Trade Section is another group from the private sector that took sides with the position of oil companies. They reiterated that the primary objective of the reforms should be to drive investment into Nigeria to ensure there are no job losses, As oil finds and new investment destinations emerge across the continue, investment will go where opportunities will yield returns. Fortunately, Nigeria meets all three expectations satisfactorily. So, that means that Nigeria already provides investors with an enabling environment to do business and thrive. Petroleum or energy reform is a national security matter. Nigerians have been listening to extractors for almost 60 years, but time has come for Nigeria to build its capacity to produce and refine hydro carbon locally. One way to do this is to have a strong mid-stream fiscal system that supports local production. What is needed is a robust system for reforming the refining sector, while establishing clear links between crude oil price to product prices. And regarding the PHCDB, states have to take part in funding the Trusts. Some revenue that accrues to the state should go to the trusts.